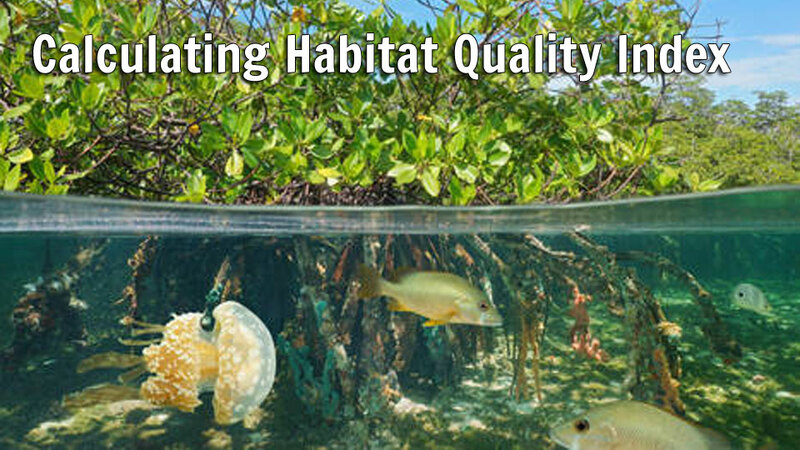 The Habitat Quality Index was developed to normalize the offset percentages from the seagrass transect data to a 0–100 scale, identical to the Water Quality Index scale. Establishing a habitat index allows future indicators to be incorporated into the index using the same normalized approach. As the offset data breakpoints for transect length were not distributed at equal intervals, custom conversion formulas were created for each of the classes defined in the previous section. The final percentage scale was divided into six classes (0% to 49%, 50% to 59%, 60% to 69%, 70% to 70%, 80% to 89%, and 90% to 100%) which allowed for easy association to a single offset class. The positive tail end of the offset scale (for values exceeding target values) were stretched to ensure future values would be incorporated. The negative tail of the data distribution has values incorporating the logical minimum of the transect offset data (100% loss of transect length) and didn’t need to be stretched. The conversion formulas use a ratio of the ranges from both class systems, a normalizing value, and a conversion factor to achieve a final percentage score. The conversion between the percent offset transect values and final habitat index classes is provided in Table 1. Table 1. Association between transect length offset and habitat index classes.